They are sold as Foot Baths. I am guessing a long time ago that is what they were. 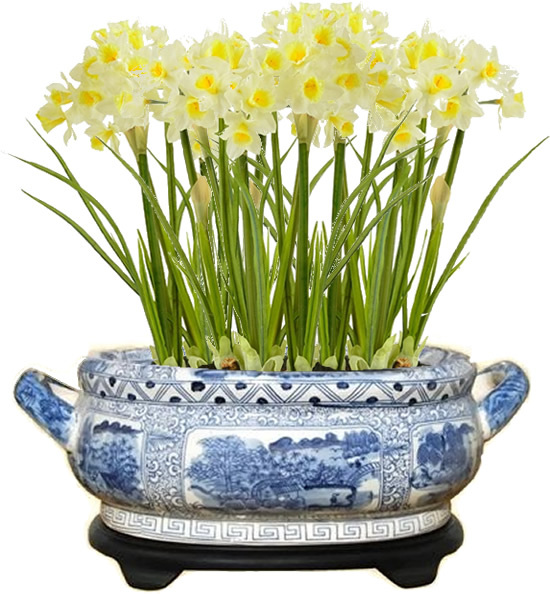 You can also find some that are oval or modified rectangle planters. 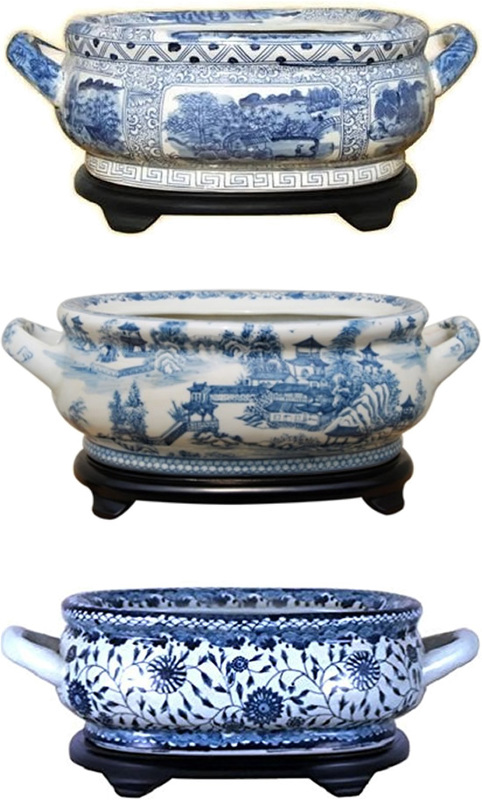 These have the Blue Willow pattern. The glaze has the crackle of raku pottery. They are available in a lot of styles and sizes at different price points. But, none are inexpensive. I don’t know how they got the crackle effect on these. When I was in High School we made raku pottery. We used the kiln that was for metal enameling. We kept an eye on the piece. When the glaze flows, it looks very shiny. As soon as all of the pot looked like the glaze flowed, the minerals that made the glaze finish melted, we took the pot out and put it into sawdust. The change in temperature made the glaze crackle. The sawdust would catch fire from the heat and make the black in the crackles. 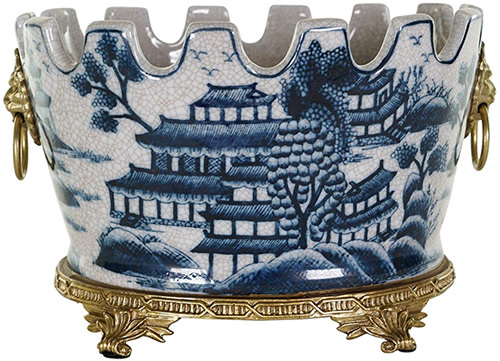 Rectangular Basin with Brass Frame and Feet – The chrysanthemum pattern is inside, too. 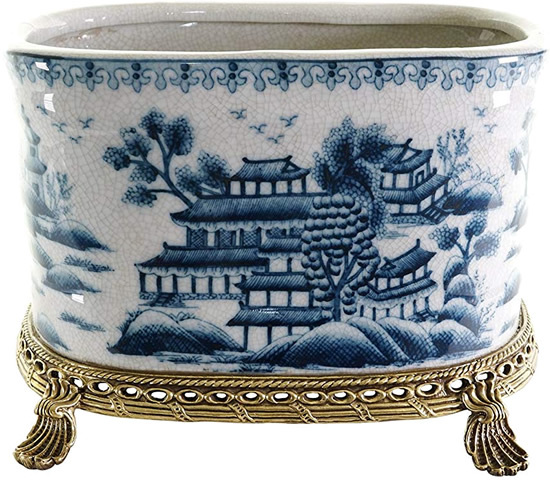 This one is a modified rectangle with Chinoiserie Chrysanthemums. The piece is held within a brass structure. 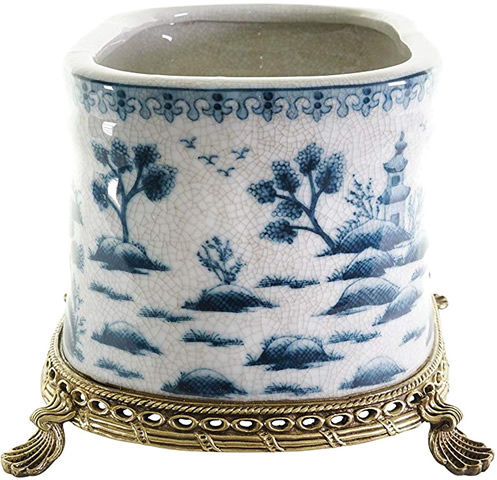 This looks like an antique Blue Willow foot bath, but it is a reproduction. This entry was posted on March 20, 2019, in Blue and White and tagged Blue and White. Bookmark the permalink.